US Trackworks, LLC is a railroad construction company located in Michigan, serving the needs of railroad customers in the Midwest. We specialize in railroad construction, maintenance, removal, engineering, and railcar repairs in Michigan, Indiana, Illinois, and Ohio. We have over 70 years of management experience and knowledge within the railroad industry. This has helped us become a leader in our field of expertise. Our mission is to provide customers with an uncompromising commitment to quality, safety, and integrity, while meeting their railway needs. US Trackworks, LLC is devoted to providing the best full service track inspection, construction, engineering, and maintenance to all customers, large and small. We will do it safely and do it right, the first time. We have the labor force and necessary equipment to complete any type of project, large or small. Our experience and equipment assures quality workmanship and safety. For unparalleled customer satisfaction, competitive pricing, and an unequaled reputation, US Trackworks, LLC is your best choice. 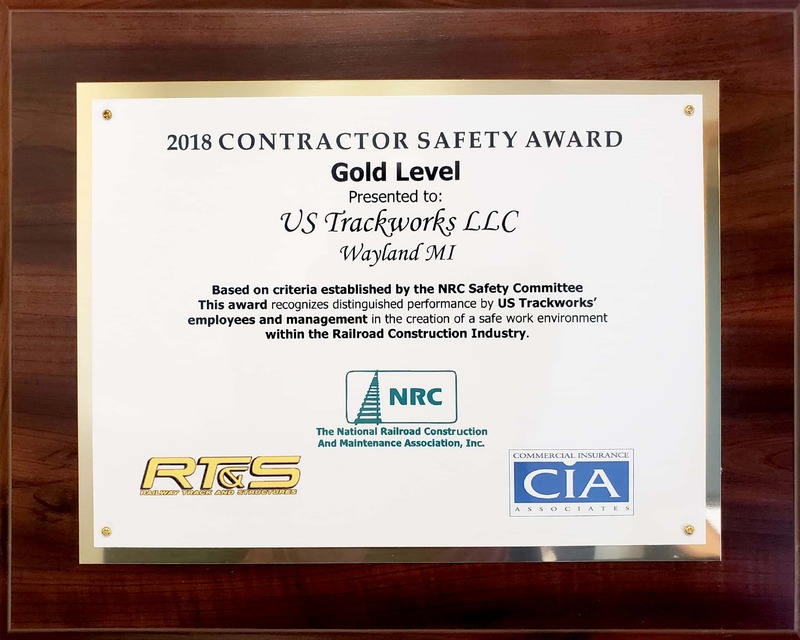 Our company was the proud recipient of the 2018 Gold Level Award in Safety by The National Railroad Construction and Maintenance Association, Inc. We are honored to have won this award as being one of the safest railroad contractors in the area. Our commitment to safety is shared by all of us at US Trackworks, LLC as we continue to meet the needs of our current and new customers. Click on our Safety tab to see other awards we have won.